We welcome you to the 9th edition of Indian Digital Marketing Awards (IDMA) & 2nd edition of Techमंच( Digital Marketing Conference, Workshop & Exhibition) to be held on June 27, 2018 at TajSantacruz, Mumbai. 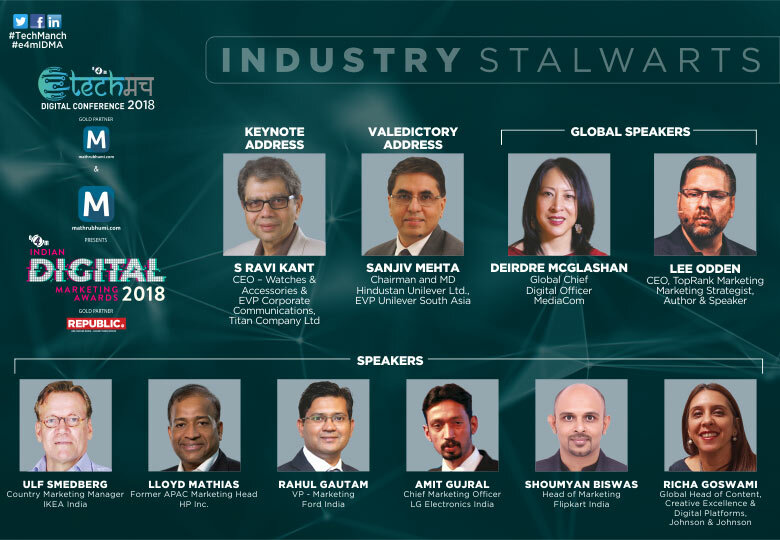 Techमंच is an opportunity to interact with Global Speakers & Indian Brand Custodians through keynote sessions, exclusive workshops and panel discussions. The conference will provide an insight of the current digital trends in the market. Theme of the Conference this year is: TECHमंच: MARKETER FIRST. Bringing marketing back to the forefront: Digital’s recent past has been marred by the concerns facing media platforms – from fake news to inappropriate content to measurement. What needs to be done to dial the conversation back on marketing and put the marketer at the forefront of change? Full Day Conference, Workshop & Exhibition followed by Digital Marketing Awards! S Ravi Kant, CEO – Watches & Accessories & EVP Corporate Communications, Titan Company Ltd.
Llyod Mathias, Former Asia – PAC Marketing Head, HP Inc.
Look forward for your confirmation to block your seat.